Enabling market systems to build long-term resilience increases household and community capacity to prepare, cope, and recover from disasters. Resilience is defined as the capacity to learn, cope, adapt, and transform in the face of shocks and stresses, including immediate and slow-onset crisis, natural disasters, conflict and instability. Communities around the globe are faced with recurring shocks and stresses that are increasing in frequency and magnitude. Overall, two billion people now live in countries where development outcomes are affected by fragility, conflict and violence. The share of extreme poor living in conflict-affected situations is expected to rise from 17% today to almost 50% by 2030. While the nature and incidences of these crises vary significantly, they affect millions of people, particularly the most vulnerable. SEEP aims to expand the scale and effectiveness of strategies that use the power of the market to support people, business and systems that are highly vulnerable to the shock-stress-shock cycle. Through the engagement of a large and diverse range of organizations in the humanitarian and economic development fields - practitioners, financial service providers, donors, governments, technology providers – we work collectively to develop and promote improved standards of practice, foster collaboration, and create opportunities for learning and access to relevant tools and technical resources. 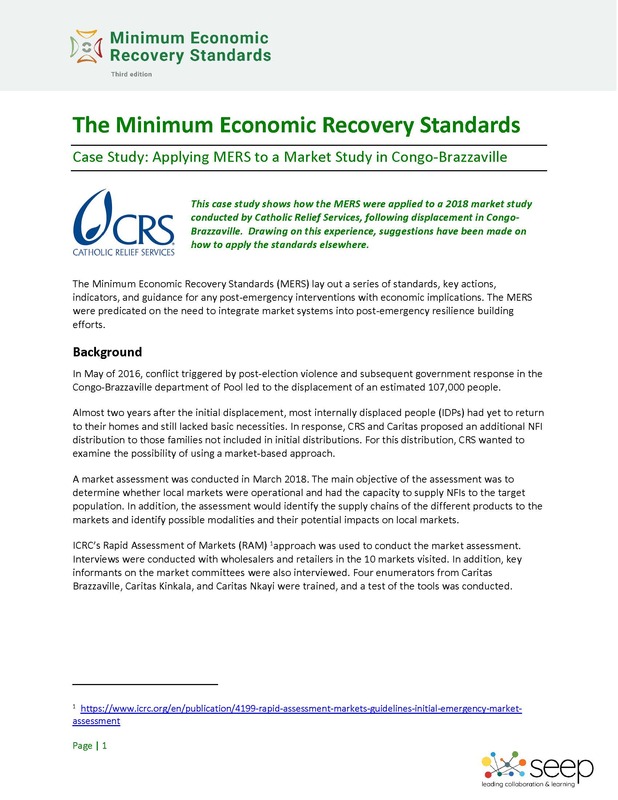 The Minimum Economic Recovery Standards (MERS) articulate the minimum level of assistance required to support the economic recovery of vulnerable populations in the wake of crises. The Markets in Crises Community of Practice (MiC) provides a forum for practitioners engaging with markets in emergency and recovery contexts to share ideas, experiences, resources and learning with the aim of improving market-sensitive programming in practice. The USAID-funded Lebanon Livelihoods Inclusive Finance Expansion (LIFE) will link vulnerable entrepreneurs at the bottom of the economic pyramid with business training and financial services, improving livelihoods, creating jobs, and reducing poverty while facilitating growth and consolidation of the microfinance sector in Lebanon. Disaster preparedness and response is exceptionally important in the context of financial inclusion. The DRR project equips financial service providers with tools and knowledge to effectively plan and cope with disasters and crises--thus reducing economic losses for financial institutions and the clients they serve. 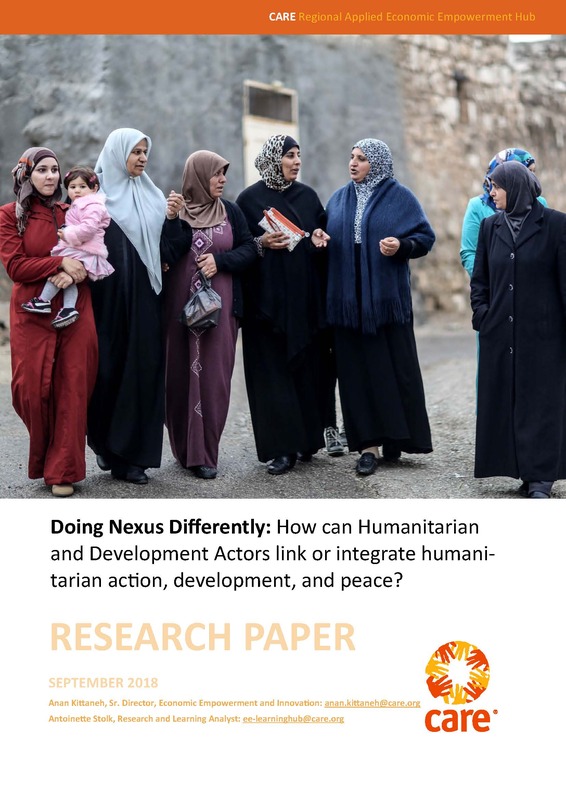 Doing Nexus Differently: how can we make sure our impact groups benefit from the Nexus?